The Adafruit plate makes it easy to use a 16x2 Character LCD directly via the GPIO pins on your Raspberry Pi . The screen is available in booth positive and negative displays. This LCD does require quite a few digital pins, 6 to control the LCD and then perhaps another 3 to control the RGB backlight for a total of 9 pins. That's nearly all the GPIO available on a Raspberry Pi, so other bolt-ons are out. This plate is perfect for when you want to build a stand-alone project with its own user interface. The 5 directional buttons plus select button allows basic control without having to attach a bulky computer. It is not pre-assembled and therefore requires some soldering skills and time or a friend called Dave! When the file opens add the two lines below to the bottom of the list. 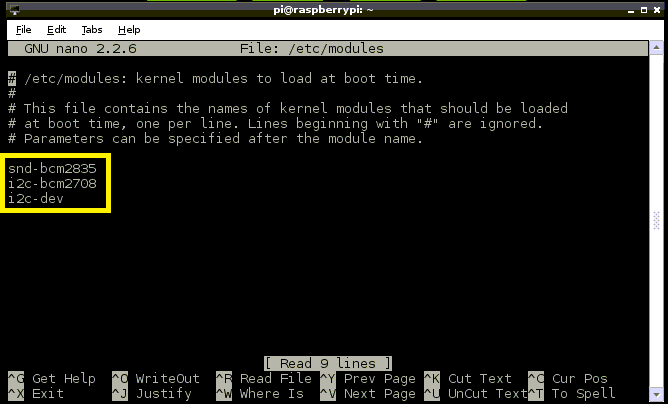 sudo reboot, this will enable the hardware I2C driver. Next step is to install the various Python libraries to enable you to program the LCD Screen, the GPIO assess and enable the System Management Bus. The easiest way to downlaod the code onto your Pi is to hook up an Ethernet cable, and clone the files directly using 'git'. Interfacing with the python example code is fairly straight forward, if you look in the Adafruit_CharLCDPlate folder you can open a simple Python script called testLCD.py, open this in IDLE to view the code. There are 5 buttons (LEFT, RIGHT, UP, DOWN and SELECT) which can be used to with the code to ask the plate which button has been pressed. where name of button is LEFT, RIGHT, UP, DOWN or SELECT. button in pressed, instead you'll have to query the button in a loop. COMING SOON - more tricky than I thought!